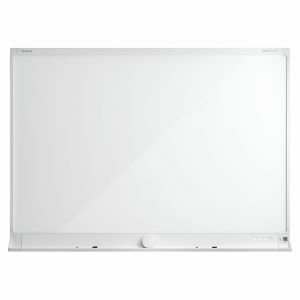 Electronic white boards have been around for a few years now but have struggled to gain much traction in the workplace. The reasoning was simple: a board that can scan its contents isn't much more useful than taking a picture of it, and the technology to scan in real time was finicky and relied on the markers as much as the board itself. Thankfully, Quartet now has a board that is easy to use, works with regular dry erase markers, and automatically streams real-time content to anybody connected online. This board simplifies every process that posed a challenge for mobile collaboration. There's no complicated set-up: mount the board to the wall and plug it in. Each board has a QR code that will connect to a mobile app that streams whatever content is on the board live. This stream can be shared with anyone in the world through the app, providing a versatile collaboration tool for any office. Since not everybody can make every meeting, even remotely, SMART kapp boards also can document what's going up on the board. With the push of a button, a snapshot can be created and either streamed to everyone following online or sent in pdf form to a connected USB drive. These can be viewed as a slideshow, tracking ideas on the board from inception to realization. With the ability to follow along anywhere and capture the image on the board, SMART kapp is finally the digital whiteboard we've been waiting for. Boards are available in a 72x53 inchsize and a smaller 23x44 inch model.